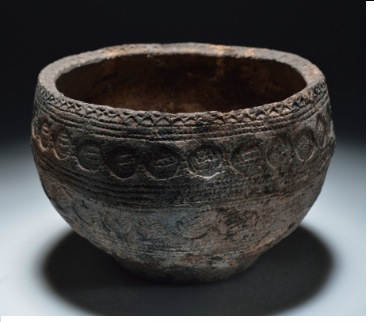 The Aberdeenshire Museums Service has chosen the late Neolithic Meethill Pot as their Object of the Month for April 2015. The bowl-shaped 'urn', which is over 4,000 years old, was discovered within a 'stone crypt' with fragments of human bone in Peterhead in 1833. The grey colour of the vessel and the unusual shape and designs indicated that it was not made locally. Aberdeenshire has one of the richest and most unique archaeological environments in Britain, especially with regard to its Neolithic heritage. It is often thought that the landscapes of the past were sparsely people, with little interaction and isolation as the norm. Aberdeenshire has been a centre of trade for millennia, and nothing illustrates this better than this late Neolithic food vessel found in 1833 when the foundations for the Reform Tower at Meethill, Peterhead were being dug. But it was not until 180 years later, during a national project about the Beaker people and their delicately-made pots, that the food vessel was identified as being Irish. Only two others of this type have been found in Scotland; one on the south-west coast and the other in the Great Glen. The discovery of this beautiful pot forms part of a story about trade from Ireland to Galloway, where goods travelled north through the Great Glen and east to Aberdeenshire. The intricate designs mean the original owner was probably both wealthy and powerful, and experts think that the whitish powder rubbed into the design may be burnt human remains. The Meethill Pot can be seen at the Arbuthnot Museum, Peterhead, until April 25. Free Saturday afternoon creative workshops for 8-13 year olds are held at the museum from 1.30-3.30pm on 11, 18 and 25 April. Photograph, create, collage, explore make your own art at the museum with a professional artist. Arbuthnot Museum, Peterhead is managed by Aberdeenshire Council and admission is free. Closed Wednesday, Sunday and public holidays. For more information contact Helen Chavez, Aberdeenshire Documentation and Archives Officer on (01771) 622807.